There has always been a struggle for system resources while using some applications on my PC’s. I run Cakewalk Sonar X1 and Sony Vegas multimedia applications currently. These programs are big users of CPU and memory resources. At times these applications are just hobbled by low resource availability. But others times they do as little as use an identical communications channel or allocated resource that some other program demands to take over. The result is often a crash by the whole computer or just the applications involved. The biggest resource offenders can be categorized in two groups: 1) Anti-Virus programs and 2) Everything Else. Anti-Virus (A/V) programs tend to be very system heavy and do a lot of probing that takes resources best used by the programs you may be trying to run. Unfortunately, ending the probing and listening by the A/V program sometimes takes some investigation. Most A/V programs have two modes; Real Time Monitoring and Media Scanning. The Media Scanning mode is usually initiated by the user or a timer. It may also be set to do the scan on startup or even shutdown. In any case it depends on the user making choices to even have it operate. Opening the A/V program’s schedule and deactivating it, then only starting the media scanning when needed, is recommended. If you must use the scheduler to run an A/V scan, set it up for a time when you won’t be using the computer. Like at 3 o’clock AM or something. Disabling the A/V scheduler requires the user to manually scan the computer on occasion to prevent virus’ and malware. You should get more involved in your computer’s health maintenance anyway. I am not going to claim this one fix will solve all your problems opening project files in the digital audio workstation Cakewalk Sonar. It has solved a problem before for me, when many of my projects created on one computer and/or version of Sonar would not open on another. Mainly I wanted to write this down so I wouldn’t have to find this info again. This process only takes a few minutes and you should know whether you are successful almost immediately. After I finished working on my digitally reconstructed analog recording, Sorry It Came To This, I wanted to write down some of the steps I took to get to the finished project, or at least my thinking on a few of the variables. Unfortunately I was a little brain dead from all of the ‘cypherin’, so I put it off. After I processed my next analog restoration, Mean and Cruel, in a similar manner, I finally decided to write a few thoughts about the whole process, before I forget it all, again. The process of reconstructing these tracks is heavily software based and not that much to do with any one of my technical abilities. It isn’t like the old days when you needed better hand-eye coordination for cutting the tape and splicing it back together. Though the process is not completely dissimilar in it’s application. I think many people could acquire the skills to reprocess analog recordings, with the automatic processing built into my Digital Audio Workstation (DAW), Cakewalk Sonar v8.5, under most circumstances. When I reprocessed Sorry It Came to This, I did use some of the automatic synchronizing capabilities of the software. When I began working on the song, using a MIDI drum controller, I recorded several drum tracks based on the rhythm of each progressive mix down during the original analog process. After determining the original tempo of the recording, I linked the internal drum synchronization to these original tracks via MIDI processing. I was able to reestablish a common beat between all of the tracks using automated audio stretching through quantization, beat grooves, and also I manually stretched or compressed portions of the audio signal when the software could not properly recognize whether it was a component of the beat or not. Doing this allowed me to replace the original MIDI created analog drum track with a MIDI drum set included with Sonar. Drum samples have improved greatly since these original recordings were made and are nearly identical to a real drum kit. The improvement in beat timing was evident as well. The amount of synchronization that I had to do on these tracks is directly related to the recording method that I used in the beginning. 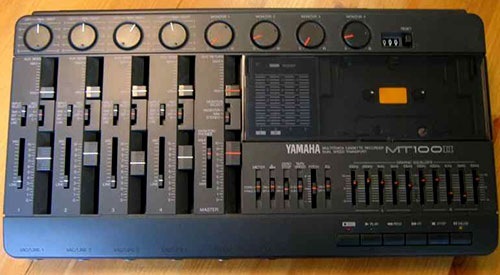 I would record the initial four tracks on my Yamaha MT-100-II multi-track cassette recorder. 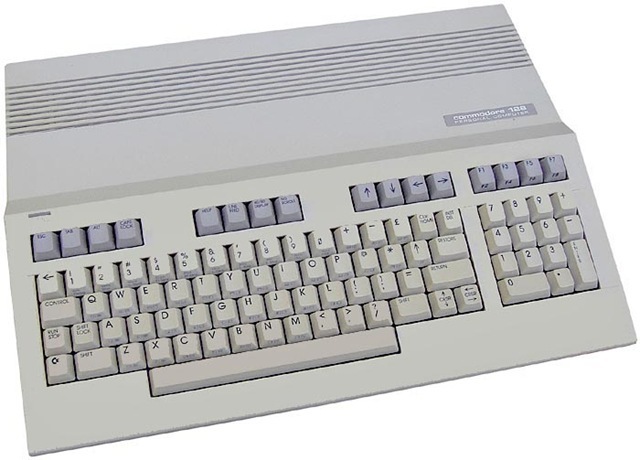 It was designed to record on chromium dioxide cassettes (CrO2) and I always recorded at the higher speed of 3 3/4 inches per second that it also featured. The reasoning behind using the higher speed is that it enhances the audio quality and reduces the tape noise in the recordings. In addition the Yamaha recorded with dbx noise reduction. The aural quality allowed using the dbx process was similar in many respects to the quality achieved in a digital compact disc (CD) recording. An advantage would have been the constant stream of audio as opposed to the digital sampling inherent in the CD recording process. Some have commented to me over the years that dbx, because of its use of compression in its methodology, called linear decibel companding, had an effect on the aural envelope, that you could hear. Compression/decompression technologies can be audible if it is used improperly, but I believe that like the opponents of the compact disc originally who thought they could hear sounds going on and off 44,100 times per second, they were a bit delusional as well. It’s probably the same people that complained about the inferiority of the minidisc that are now completely satisfied with the sound of the much,much inferior MP3 player. For a number of years I have had a program called End It All 2. What this utility does is identify processes running in the background on your computer that may be unnecessary and stops them. The reason you would want to stop them is in many cases they are just running for no reason and using up system resources that could be devoted to the application that you are using. In my case I use a multitrack recording and editing program called Sonar 7. 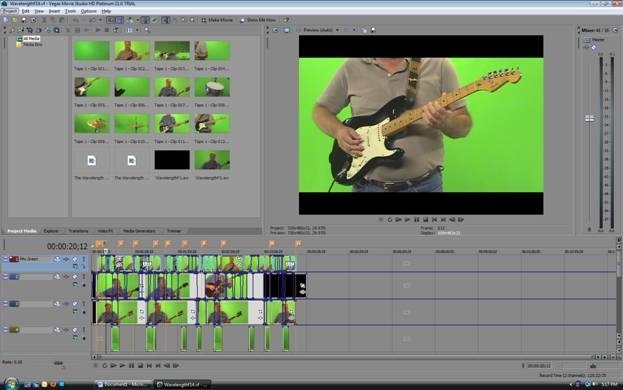 Recording and processing audio on a computer uses a lot of system resources and having a little extra power certainly doesn’t hurt any. Another application for End It All 2 is computer gaming. While there can be many moving objects on the screen at once while gaming, there is even more happening in computer memory and processing. The more spare RAM and CPU cycles you have can make a difference in the quality of the gaming experience. 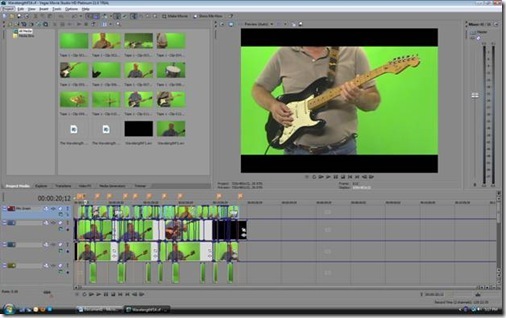 Even video playback and creation can benefit from the additional resources gained by stopping unneeded processes. As I recall, End It All 2 was originally written around the time that Windows XP was created. I have used it on Windows 2000 and XP. It will work on Windows 98 and Windows ME as well. I recently tested End It All 2 on Microsoft Windows Vista Ultimate and it seems to work OK on it too. Malware; Virus’, Spies, Ads, and Bot’s or How’s That "Free Anti-Virus" Working Out For You? When referring to a computer virus, there are many types that are easily confused. I tend to refer to all as Malware (malicious software). The bottom line is that they all do about the same things, in different ways, for different reasons. Some take control of your computer for nefarious purposes. Others were created just to make your life a little more difficult. I have been asked several times recently about Personal Anti-Virus, a "rogue" program that had been infecting computers in the last few months with a Trojan Horse. I looked it up on search and anti-virus web sites. The response from Symantec (Norton) went something like, "Had you had our product installed, this wouldn’t have happened to you." Not very diplomatic or helpful, but probably true. Some of the other responses I found were to use other "rogue" sounding programs that probably would make it worse. There were some helpful posts around the web in my search for a remedy for the Personal Anti-Virus, which if one had enough computer knowledge, they could eliminate pretty much the whole threat. Unfortunately some directions I found were more complete than others, leading to immediate re-infections by the rogue program. I don’t think most casual computer users would have the patience to continue past that point. In many cases, the Malware is spread to so many places on the computer hard drive that removing it manually is not worth the effort. Some times the existing Anti-Virus program has been uninstalled or crippled by the Malware as well. Often the most obvious way of ridding the system is using specifically created software for Malware removal or by doing a system restore of one kind or another. After removal, Anti-Virus program re-installation may be necessary too. 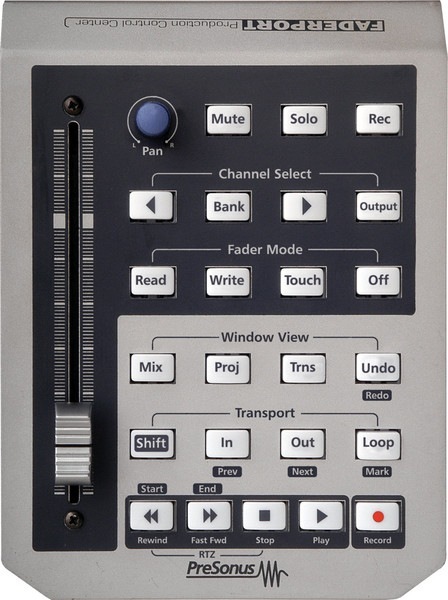 During my recent adventures with ADAT digital audio transfers from my Fostex VF-16 digital multi-track recorder to my PC computer, I discovered ASIO (Audio Streaming Input Output). ASIO was developed by a musical company called Steinberg. It is a mostly open standard that has had a big impact on computer recording. I really didn’t know that much about ASIO before I started experimenting with my ADAT card. The only thing I knew was that my soundcard on my main computer was capable of ASIO audio production. I also knew that when I tried to use the computer in my studio area to record, I was terribly disappointed with the results. Basically what ASIO does is take all audio information to and from a digital audio program, like Sonar 7, and routes it directly to the soundcard. The benefit of this direct connection is a reduction in the latency in the audio. Latency in this case, refers to the amount of time it takes to get from the input of the sound card, through all the sub-systems, and then on to the output. ASIO allows whatever is on the input of the sound card to arrive at the output in a more efficient manner. For ASIO drivers, Steinberg claims a latency of equal to or less than an imperceptible 2 milliseconds. Previously when I had tried to use a computer as a multi-track recorder in place of my Fostex, I noticed very discombobulating delays in monitoring what I was recording. It was so bad that I could not record anything at all. The latency (echo) was way too extreme.